If you’re questioning whether it’s worth wrangling your little one into a dental routine now, these facts prove that adopting good habits early on can pay off big time for your child’s oral health down the road. 1: Baby teeth help shape your child’s speech. Forming and pronouncing words correctly depends largely on the presence and alignment of baby teeth. Premature loss of any primary teeth can result in speech impediments such as a slur or lisp, and negatively impact both a child’s ability to communicate and his or her self-esteem. Depending on the severity of the case, a speech pathologist may be required to help correct the problem(s). 2: Baby teeth facilitate proper chewing and eating. In addition to efficiently breaking down solid foods, chewing correctly is important for other reasons. Tooth loss and/or alignment issues can cause unnecessary stress to the jaw and result in serious complications over time, and chewing problems can also interfere with the development of key facial muscles. Improper chewing can even contribute to a nutritional imbalance if poor oral health starts impacting food choices. 3: Baby teeth act as a placeholder for permanent teeth. 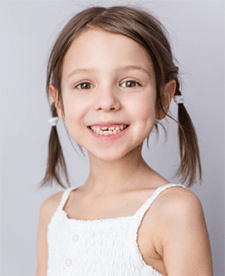 Permanent teeth will emerge, but how and where has a lot to do with your child’s first set of pearly whites. Each primary tooth reserves a spot for a permanent tooth, but the loss of this initial placeholder can cause shifting and result in harmful misalignments. Cosmetic issues aside, misaligned teeth can make brushing and flossing more difficult, result in crowded and/or impacted teeth, and contribute to jaw disorders such as TMJ. 4: Maintaining healthy baby teeth helps to instill effective dental habits. Teaching the ins and outs of good oral hygiene can have a lifelong impact on your child. Introducing healthy dental habits early on can solidify the importance of preventative dental care, making it easier for him or her to stick with these habits throughout adulthood. This can mean a lifetime of optimal oral health, and significantly reduced chances for costly dental problems. Brushing and flossing may not be your child’s favorite activity, but introducing healthy habits the moment that first tooth appears can make it easier for both parent and child to stick to a routine. Paying a visit to the pediatric dentist before your child’s first birthday, and getting regular checkups are also crucial to his or her oral health. Depending on your child’s individual situation, certain in-office treatments and/or instructions for at-home care may be recommended. *Note: Fluoride toothpaste should be expectorated and not swallowed. If you feel your child will swallow the fluoride toothpaste it can be substituted with non-fluoride toothpaste. This entry was tagged Baby Teeth and Speech, Baby Teeth Care, Dr. Geri-Lynn Waldman DDS, Hudson Valley Pediatric Dentistry, Hygiene For Baby Teeth, Middletown NY Dentist. Bookmark the permalink.